Have you made some New Year’s resolutions this past week and are finding yourself breaking them already? If that is the case, it’s not too late to make another resolution that you can keep. Many of us enter the New Year with aspirations of going to the gym consistently every week, eating an extremely healthy diet, and ultimately trying to live a much healthier lifestyle. But often we don’t realize that hearing health is equally important to our overall health. Statistics show that roughly 40 million Americans suffer from hearing loss, and in many of these cases it is preventative. Start off your year right and make that resolution to improving your hearing health. Hearing is critical in our ability to communicate with others in this world. Even slight hearing loss can impact our way of interacting with others in our daily lives. Many of us don’t realize how common hearing loss is because so often it’s a gradual progression. About 40 million Americans suffer from some form of hearing loss and it is more common in those with a history of smoking, drinking, and circulatory illnesses. Men suffer from hearing loss 5 times more than women, and half of all seniors over the age of 70 struggle with hearing loss in their daily lives. As these statistics show, hearing loss is more common than one might think. Healthy lifestyle choices influence hearing health. Not only are you maintaining a healthy weight and gaining more energy, but incorporating a healthy diet abundant in vitamins is good for your hearing health. Making such choices will help your ears stay sharp for years to come. Studies have shown that smoking negatively affects hearing health, so making the smart choice in quitting not only decreases your chances of cancer, but also mitigates hearing loss. Being more active also contributes to better hearing health as it gives you more energy and normalizes blood flow, which ultimately keep your ears healthy. Just being aware of the commonality of hearing loss and making smart, healthy lifestyle choices isn’t enough. One of the best things you can do when it comes to hearing health is to actually set an appointment for a hearing test. It is recommended by audiologists that adults over 45 should have their hearing tested at least annually. Many of us may not even think that we are experiencing hearing loss. It may be hard to notice since hearing loss is often gradual. But if you find yourself having a hard time hearing in normal group conversations, or turning up the volume on your TV or phone, you may be experiencing some sort of hearing loss. Scheduling a hearing test with a hearing health specialist will give you a comprehensive analysis of your hearing health. If you already have hearing loss and are using hearing aids, January is a good time to get them checked. If it’s been over a year since your last check-up, it is important to have a tune-up of your hearing aids every six months to ensure everything is in good working order, and your hearing aids are helping you hear. If you find that your hearing aids aren’t a good fit, seek a hearing health specialist to reassess what type of hearing device might fit your lifestyle best. There are new hearing instrument technologies released every year, so if your current hearing aid is outdated, it might be time for something newer. You’d be surprised how many new ways there are to assist your hearing ability. 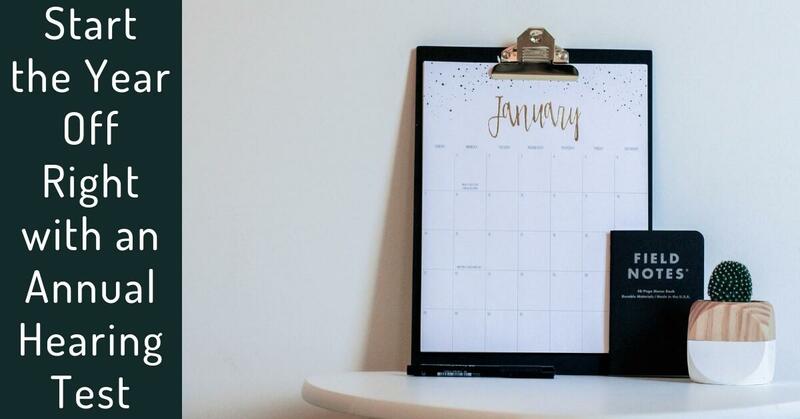 Resolve to make your hearing health a priority in 2019. It’s not too late to add focus on your hearing health as a resolution. Whether you need to get a hearing test, find a hearing device to improve your hearing, or upgrade your current hearing instrument, be proactive and take charge of your hearing health this year. Take steps to ensure your best hearing health today! Schedule a hearing test or screening with Beverly Hills Hearing Center and be on your way to a healthy hearing year!